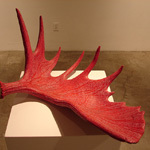 Jude Norris writes on the surface of deer antlers; in her work Braver Antler her tiny, disciplined words repeat the phrase “I am brave. ” Similarly, in The Imperfect Doll, her hand-crafted doll, carefully beaded and produced through traditional crafting methods, becomes a site for the written word: words are inscribed in looping handwriting over the surface of her dress. The doll is propped in front of a tiny television set. 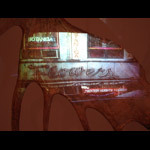 In Big Apple Antler, Norris projects images from New York City’s heavily text-laden urban environment - in this case a flower shop – onto the surface of an antler, associating text with image as well as the urban with the natural world. 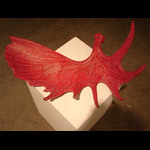 Tatakwan (aka Jude Norris) is a multi-disciplinary Plains Cree Metis artist from Edmonton, Alberta (Plains Cree Nation territory). She studied painting & experimental sculpture in London (UK) at Middlesex University & Kensington & Chelsea AEI, as well as Integrated Media at Ontario College of Art & Design in Toronto, Canada. Tatakwan has created bodies of work in a variety of media, materials, genres & styles including: physical & digital painting & collage, drawing, linocut printmaking, photography, beadwork, doll-making, performance, animation, experimental video, video installation & sculpture. 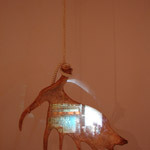 Her installation & sculptural works contain a variety of physical materials & creative methods & practices.